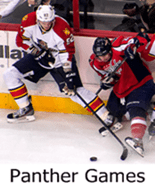 South Florida Attractions News by South Florida Limo Service | Smile! We bring you South Florida Attraction news daily. Smile! We bring you South Florida Attraction news daily. 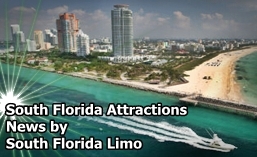 South Florida Limo Service: Welcomes you to its first “South Florida Attraction” news letter. Open 24 hours a day, 365 days a year, Seminole Casino Coconut Creek has completed a $150 million expansion with a 100,000-square-foot gaming floor, the non-smoking, well-appointed Stax Poker Lounge located on the second floor, and three new restaurants, the upscale NYY Steak, the spectacular flavors of Italy in Sorrisi Italian Restaurant, and the New York-style 1st Street Deli. NYY Steak is open Sunday, Monday, & Thursday 5 p.m.-10 p.m. (closed Tuesdays and Wednesdays) and Friday & Saturday 5p.m.-11p.m. Legends Lounge is open until 2a.m. Friday & Saturdays at NYY Steak. Sorrisi Italian Restaurant is open daily 5 p.m. – 11 p.m. (Wednesday-Saturdays) and noon to 8pm on Sundays. 1st Street Deli is open every day from 11 a.m. – 11 p.m.
5,700 square feet of retail shops are located on the first floor courtyard of the new 2,400-space LEED Silver Certification-registered parking garage. On the south side of the state-of-the-art green garage there is a convenient transportation hub consisting of a large charter bus service lounge for the comfort of guests, a valet station, and a guest vestibule. The Pavilion, South Florida’s best live entertainment venue, is our intimate 1,200 seat entertainment venue. The Pavilion hosts fun-filled entertainment such as well-known national acts from music to comedy. Make sure to get your tickets for our upcoming live entertainment at Ticketmaster. We hope that if you are ever going from Boca Raton, Del Ray Beach or any other area in South Florida, that you take a look at our fine luxury limos and our#1 rated safe SUV to travel to the casino in. South Florida Limo has the best limo rates in the area and we hope to see you soon. Each day we will post something new and fun that is going on in South Florida right now today, and upcoming attractions that we think you may enjoy. Photos, videos and exclusive articles will be coming your way, and we look forward to receiving and helping you post your attraction that both tourists and local Floridians may enjoy. If you have a site or attraction that you wish people to visit, send us a link and we will help spread the word for you. Well that’s it for now…We will start Sept. 21st. with our first article. Thank-you for visiting us and we hope you come back.